This is a two-player game, played on a board depicting twelve islands. Players use cards to place bridges between these islands or remove opponent's bridges. If you get the majority of bridges around an island, you place one of your marker stones on it and also remove any of your opponent's bridges to that island - which might cause them to lose a bridge majority on an adjacent island and lose a marker stone there. The game is played in three rounds. A round ends when all cards from the face down deck and the three face up cards have been taken. 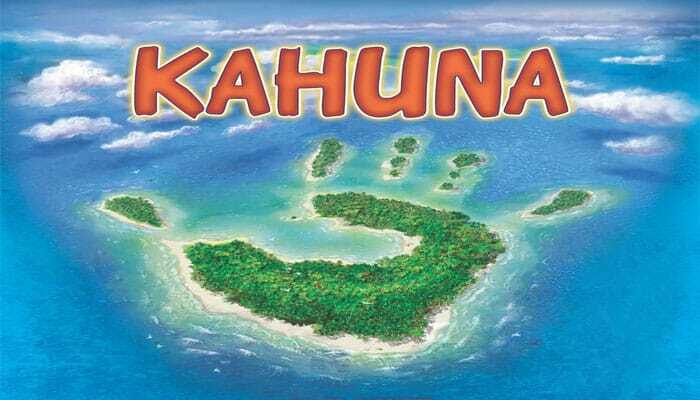 Then points are scored for the islands with a marker stone on them. The game can also end sooner when one player has absolutely NO bridges left on the board. The Kosmos edition has excellent graphics and nice wooden pieces and plays very well. 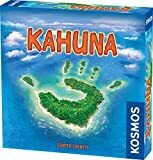 The game was originally published in 1997 as Arabana-Ikibiti by the designer's own publisher Bambus Spieleverlag, then reprinted by Funagain in the U.S., Kosmos' Kahuna - part of its Kosmos two-player series - is the best known implementation of this design. A player may only place a Kahuna bridge on a free connecting line between two islands if none of these two islands is under the opponent's control (none of them is marked with one of his or her Kahuna tokens).